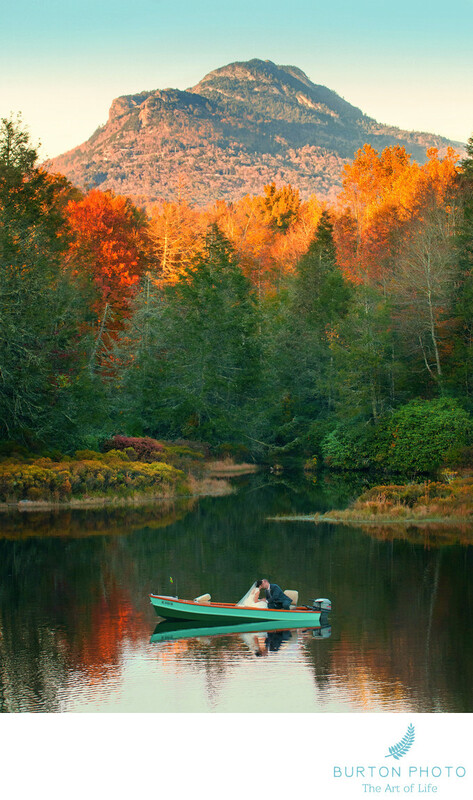 The "Camp" at Eseeola Lodge in Linville, NC offers everything a bride and groom could want for a mountain wedding. We have photographed numerous weddings at this amazing venue and it's one of our very favorite places to work! Brad and Holly chose Eseeola because the mountains are so dear to them. Brad was the starting center on the Appalachian State Football team that won 3 national championships in a row and beat top ranked Michigan in a game that will never be forgotten by the High Country! They wanted their wedding to be in the place where the met and already had wonderful memories. Brad's grandfather hand-built the beautiful boat in this image and Brad took his new bride in a spin on the lake to spend some time honoring his grandfather's memory. It was magical. We loved the reflection of the leaves in the water and Grandfather Mountain was ablaze in autumn color. The talented experts at Eseeola Lodge take the best care of our wedding couples. Every detail is attended to, the staff is attentive and the food is delicious. It's one of the few venues in the High Country that can accommodate a large wedding. Location: Camp Yonahnoka, Eseeola Lodge, Linville, NC.